The Amel Maramu has an enviable reputation as one of the most popular blue-water cruisers in the world. Whilst she may not be as fast as her larger sister the Super Maramu, the Maramu is regarded as an extremely comfortable boat that allows you to cover the miles without really noticing. 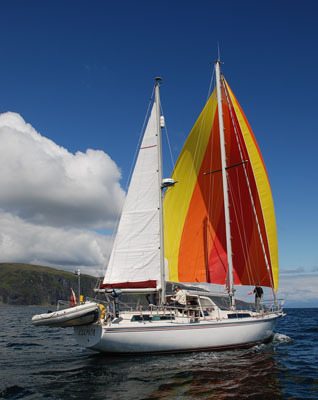 Like all Amels, Clova has her quirks, but we feel she is ideally suited to cruising on the west coast of Scotland and beyond. One of the many features that makes the Maramu so attractive to long distance cruisers is the fact they have an integral watertight main bulkhead. 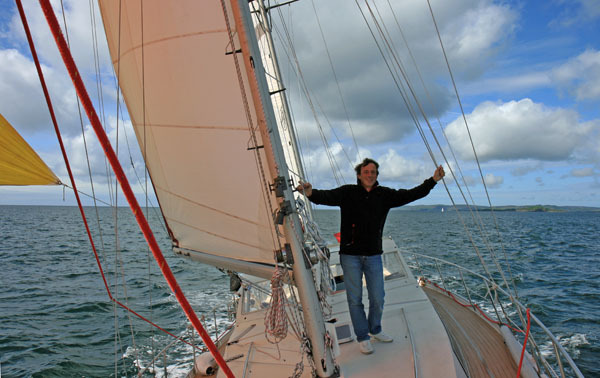 This allows her to be Coded to MCA Category Zero, which means that she can be bareboat chartered for trips to Iceland, the Faroes, Norway or northern Europe and, in the future, for winter trips across the Atlantic in the ARC and similar rallies. 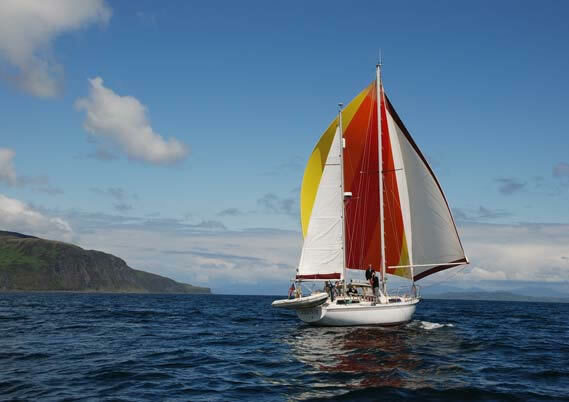 Similar features which make the boat so suitable for long distance charters include a 1,000 litre water tank, integral (padded) lee board in the saloon and full lee-board provision in both the fore and aft cabins. The 'standard' layout for the Maramu consists of two large cabins for and aft, each with two heads and ensuite heads with shower. The saloon has a single berth to starboard and a double to port. 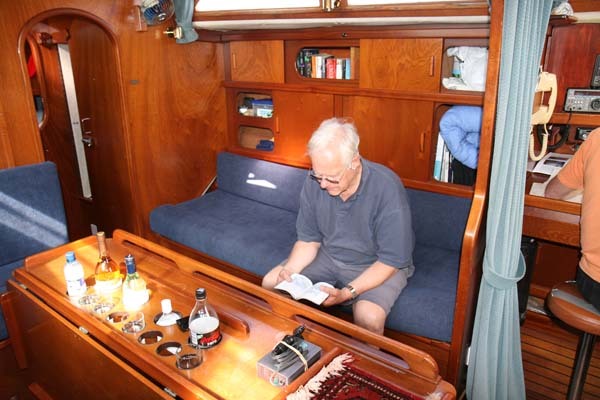 We have added an eighth berth that is located in the walk-through to the aft cabin on the starboard side. Clova has a well equipped galley with three burner cooker with oven and grill, as well as a fridge with separate 12 and 220v compressors. Her central heating system is fed to all cabins from the diesel powered heater. 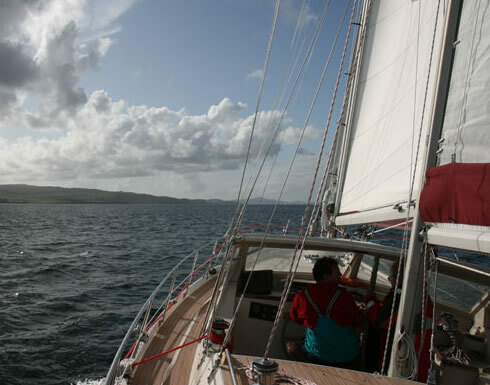 On deck all of Clova's 'standard' sails can be handed from the cockpit - the mainsail reefs within the mast, whilst the mizzen is conventional slab reefing and the genoa is furled by an electrically operated Bamar system. 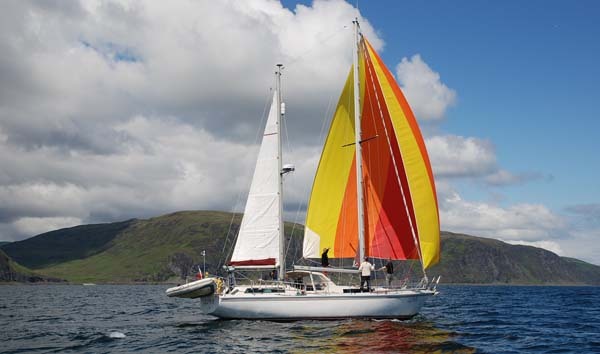 The main boom also has a boom brake gybe preventer fitted for extended passages downwind, and we can supply her with a spinnaker and/or cruising chute if required. All winches are accessible from the cockpit, where there is also a remote control for the electric anchor windlass and the control panel for the autopilot, as well as the controls for the bow-thruster. Like all of our boats she comes with complimentary outboard motor and tender, and all of the safety equipment required to comply with her Coding status. Clova's engine is a new Beta/Kubota four cylinder 75hp unit driving a three bladed propellor. The electrical system is 12 volt throughout, recharged by engine driven alternator and 220v battery charger for when alongside. The shorepower is also connected to an immersion heater for the hot water system. Clova has two sizeable battery banks, one of which (the domestic) has a capacity of over 850AH. This has allowed us to install a powerful 1600W inverter which provides 240v throughout the whole boat. Clova's navigation equipment includes fixed and handheld VHF units together with Kenwood TS430 SSB transceiver with Kenwood AT 230 antenna tuner. She has GPS and chartplotter, together with an integrated Furuno radar system and wind, speed and depth instrumentation, together with a comprehensive folio of Admiralty charts and leisure folios, pilot books and almanacs etc.